Tube amplifiers are considered “state of the art” in the audio area. They are available in Class A and Class A / B. With these circuit variants, 50-25% of the power dissipation is produced, and the output stages become quite warm. In addition, they are heavy and sometimes difficult on tour. With FRFR it is about amplifying the signal from the modeler as linear as possible. 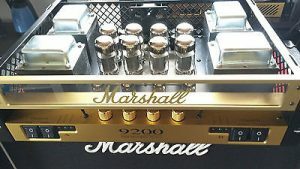 With tube-amps something like this is not feasible. 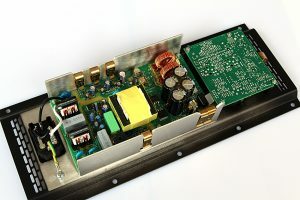 Although it is possible with a special winding technique to design a tube power amp approximately linearly, but this is almost never used in practise. Especially not for guitar amplifiers. For normal guitar preamps, tube amplifiers are still the best choice, but for the FRFR amplification, tube amplifiers are not suitable. In the case of transistor amplifiers, the power loss is slightly less (round about 20%). So they get a bit less warm. In most cases, current transistor amplifiers operate in Class A/B. The frequency response is linear – that is the best prerequisite for FRFR! Fat and heavy transformers are often installed in transistor amplifiers, which always drives the weight of a device upwards. So: For FRFR good, but often heavy. The so-called “digital amplifiers” do not really work digitally. It is only natural to call power amplifiers in class D mode and higher as “digital amplifiers” because one might think that the “D” in “Class D” comes from “digital” – but it doesn´t. These amps operate with pulse width modulation (PWM) and have an efficiency of around 90%. Because of this, the power supply units (switching power supplies without a thick transformer) don´t need to be as big as with normal transistor or tube amps. Class D amplifiers are almost no longer hot and are much lighter than tube or transistor amps. They are said to sound “hard”. This comes from distortions that arise when the internal clock is too low and/or due to timing errors. Modern designs do not have this problem anymore. Class D amps are the first choice when it comes to FRFR amplification. So it´s no surprise that BlueAmps are equipped only with modern power amplifiers in Class D and higher.